This article contains facts and information about the life and times of the famous Native American Indian chief known as Sitting Bull. 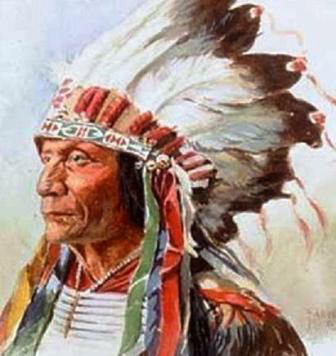 He was a noted leader of the Sioux tribe and, together with Chief Crazy Horse and Chief Gall, gained a famous victory at the Battle of Little Bighorn on June 25 1876 that ended in a catastrophic defeat for the US and the deaths of George Custer and the 7th Cavalry. The stunned US reaction to the defeat at the Battle of Little Bighorn prompted a massive outcry and the US government flooded the area with troops, forcing the Native American Indians to surrender or flee following the battle. Who was Sitting Bull and why was this Native Indian chief famous? Sitting Bull (c.1831–90) was the famous Sioux war chief who led the Sioux in the fight to retain their lands against settlers in the northern Great Plains and against United States Army troops. He was present at the Battle of Little Bighorn on June 25 1876 against the US troops led by General George Custer (1831-1890). Sitting Bull was killed in 1890 during the Ghost Dance turmoil - refer to the story of the Ghost Dancers. The following fact sheet contains interesting facts, background history and information about the life of Sitting Bull and the events in history that led to his fame as a great Native American Indian leader. Why was Sitting Bull famous? He was a Teton Dakota Indian Chief. He was the reason the Sioux tribes were united against their struggle to survive on the North American Great Plains and a famous Native Indian leader at the Battle of Little Bighorn. 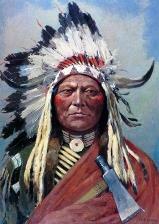 He was the tribal chief of the Hunkpapa Lakota who went against the United States policies. The tribe’s enemy was the United States government. The hostility started when the United States took ownership of the Black Hills, which was a sacred area of the Native Americans. The following Sitting Bull timeline charts the life and his resistance against the encroachment of Soiux tribal lands in Dakota. 1868: Fort Laramie Treaty of 1868 was made in which the US army agreed to abandon the posts along the Bozeman Trail. 1876: On 5 June 1876 Chief Sitting Bull joined the Sun Dance alliance, named after this famous ritual, between the Lakota Sioux and the Cheyenne. 1884: Sitting Bull toured parts of Canada and the northern United States in a show was called the "Sitting Bull Connection" where he met Annie Oakley and "adopted" her as a daughter. He named her "Little Sure Shot". 1890: Fearing the Ghost dancers would start another war Sitting Bull was killed by Indian police at the Standing Rock reservation in South Dakota on December 15, 1890. The Battle of the Little Bighorn started when the Americans discovered gold in the Black Hills and owned the sacred area following the 1868 Fort Laramie Treaty. The Americans forced the natives to live in the Great Sioux Reservation so they can open mining and settlement. The natives who would not live in the reservation were called hostiles by the United States Interior Department. During the Sun Dance Ceremony on the Little Bighorn River, Sitting Bull danced for 36 consecutive hours and sacrificed around 100 pieces of flesh. After his performance, Sitting Bull informed his tribe that he had received a vision that they had won over the American army. True to the vision, on June 1876, they won against the Americans in the Battle of the Rosebud. After a week, they had a very famous victory against General George Armstrong Custer. Sitting Bull had around 1500 men, both Sioux and Cheyenne warriors, against the undermanned American army of about 200 soldiers. The combined force of Sitting Bull had killed the entire regiment including the American general, George Custer. The stunned and furious reaction to the US defeat at the Battle of Little Bighorn prompted a massive outcry and the government flooded the area with troops, forcing the Native American Indians to surrender or flee. Sitting Bull was killed amid fears of his involvement in the Ghost Dance movement. The Ghost Dance movement was revived in Nevada in the year of 1888 by two Paiute shamans, called Wodziwob and Wovoka. The Ghost Dance was part of a mystical ceremony designed to re-establish the Native Indian culture and restore the environment to pre-European levels. The dance was believed to help recover the riches the Native Americans once had with lush fields and abundant herds of bison and to rejoin the people with their ancestors. It also included the promise of the white men being swallowed up by the earth. Sitting Bull was killed by Indian police at the Standing Rock reservation in South Dakota on December 15, 1890 during the Ghost Dance turmoil. In 1891, there were about 571 Hunkpapa Lakota that were living in the Standing Rock Indian Reservation of North and South Dakota at the time. For additional facts and information refer to the legend and story of Sitting Bull, the Ghost Dancers and the story of the Sioux War. Sitting Bull! Discover the vast selection of pictures on the subject of the tribes of Famous Native Americans. The pictures show the clothing, War Paint, weapons and decorations of various Native Indian tribes, such as the Sioux tribe of Sitting Bull, that can be used as a really useful educational resource for kids and children of all ages studying famous Native Americans such as Sitting Bull. We hope you enjoy watching the video - just click and play - a great educational resource for kids.